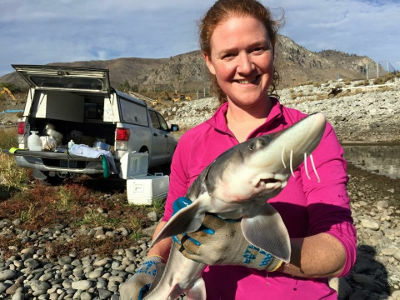 Julie Harper is a Fish and Wildlife Biologist with over a decade of experience, seven years in the Columbia River basin, and eleven in the Pacific Northwest. Ms. Harper is an expert in the application of radio- and GPS-telemetry to meet study objectives. She has conducted studies using biotelemetry techniques on a wide range of aquatic and terrestrial wildlife species. Ms. Harper also has experience in environmental services including preparing and reviewing National Environmental Policy Act (NEPA) documentation (e.g., determination of Categorical Exclusion Subject to Federal laws and authorities [CEST] and environmental assessments [EAs]) and engaging in consultations with State Historic Preservation Officers (SHPO), tribal entities, and the U.S. Fish and Wildlife Service (USFWS). Research studies that Ms. Harper has managed throughout the United States have included investigations of general biology, behavior, movement and dispersal, genetic diversity, feeding characteristics, two-choice trials, as well as habitat assessments. Ms. Harper has extensive training and work experience with wildlife capture, animal handling, chemical immobilization, and tagging (surgical, external fixation, and subcutaneous) for a wide range of terrestrial and aquatic wildlife species. Ms. Harper has extensive experience adhering to the Animal Welfare Act, local, state, and federal laws pertinent to working with wildlife species and toxicants. She completed a MS in Forest Science at Oregon State University in 2013 and a BS in Zoology at University of Washington in 2000.